I’d like to talk about the Dark Moon Lilith and how I recently came to understand it’s place in astrology. But, before I get into this, I want to be perfectly clear that I’m not referring to the asteroid 1181 that’s called Lilith; nor am I talking about the Moon’s apogee which is also referred to as Lilith. If you’re looking for information on either of those two heavenly bodies, adjust your scientific cap and look elsewhere. This article might be a little too vague for you. This video is similar to the content of this article. So here, I want to talk about my journey to finding Lilith and, in so doing, hopefully explain why it was so satisfying to finally come to my current level of understanding. The journey started with I was a teenager. My mom, Mahala, had been studying astrology and she started talking about the Dark Moon Lilith. She pointed out that there was a second moon orbiting the earth that didn’t reflect light, thus, no one can see it. The only way you can see it is when it performed a solar eclipse. In the astrology charts that she would craft for people, she would pencil in Lilith’s location so as to be able to interpret it’s influence on the person she was reading. Lilith’s influence was obvious and it worked. Even though I was studying meditation, reading eastern philosophies and working on manifesting wine from water, the idea that there was a moon circling the earth that had influences over people that no one could see seemed a little to far fetched to really believe at the time. Fast forward to today. As many of you have already seen, I wrote an astrology program to display the planets over the map of the earth so as to capture Mahala’s techniques visually. When doing so, I went looking for the ephemeris of the Dark Moon Lilith in order to complete the spread of planets that she uses on a regular basis. Unfortunately, this is where the problems began. I discovered that there were three ‘things’ called Lilith two of which have well defined ephemeris data of which neither of them where what Mahala uses in her charts. When I looked deeper, it turns out that a person by the name of Waltemath first discovered Lilith when it eclipsed the Sun and he worked up a calculation to determine its path through the sky. The swiss ephemeris tools output this calculation as ‘Waltemath’ which I promptly used in my program only to find that it didn’t line up to Mahala’s Lilith’s sign and degree. As it turns out, after Lilith was discovered, another astrologer came along and had to interpret Waltemath’s calculations and in so doing, generated numbers that were 2 to 40 degrees different. The ephemeris for these calculations ended up in books and came to be known as Jacobson’s Lilith or Jacobson’s Dark Moon Lilith. There were a number of books sold containing these calculations which astrologers used and validated through there personal experience that where Lilith was in your chart, powerful things would happen. So, at this point there are four Liliths! Two can be proven via astronomy and the other two are based on a planet that no one can see, which was only seen twice over a couple hundred years ago! Yet, when you place Lilith in your chart using Jacobson’s calculations, it will help you see deep subconscious aspects of yourself that are accurate and work. Can you see my conflict here? You can’t see the planet! If you can’t see a planet, where is the planet? No wonder the astronomers can’t determine the ephemeris of Lilith! Likewise, if you can’t see the planet, why are the astrologers using this influence in the charts? There had to be a reason. 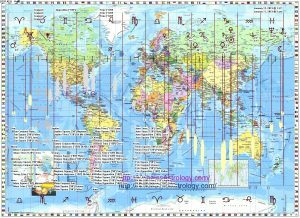 If the planet doesn’t exist, how can it work in the astrology chart? This is where my core premise that astrology is a consciousness science comes in. The idea here is that what we experience as influences from the planets is really influences from the subconscious playing out for us to see. Conscious and subconscious are only differentiated because we are aware of one and not the other, yet they come from the same source. Another way of stating this is that we perceive one, but not the other. Another attribute to add to this is at the core of a human is consciousness. Consciousness is that spirit, that inner Being, that part of us that experiences what we do and influences how we act. It is that part of us where the inner knowing comes from and it never grows old. On top of this, consciousness directs energy. It directs energy to move to the appropriate place. In other words, unlike what the scientists believe and what they preach, the universe is not random; it is of conscious design. Linking these all together makes me question the fundamental ideas of astrology. In other words, where did it come from? Or, another way of looking at this is what is the cause and effect dynamic for astrology? Did astrology develop because the planets have physiological influences over people? or did is develop because people noticed behaviors that seemed to fit the dynamics of the stars? Or, is there another approach that is linked closer to the idea of consciousness? I would word it something like, astrology works because astrologers have commanded it to work by outlining specific rules by which the subconscious must follow to satisfy the request. Because we’re talking a consciousness science, the idea here is that someone made up the rules of a game (much like Tarot) which the subconscious works to make come true. It’s like we have to use our imagination a little here. This idea is linked to the concept of manifestation – when you believe, the subconscious will work to make it happen. Now, what if centuries ago, someone believed that seeds seem to grow better when planted at the new moon and they told others about it and, in turn, the people that heard this believed that it would work for them too. So, they planted seeds at the new moon with the expectations that they would see them grow better. What if, because everybody believed this and people are consciousness which directs energy, the mire belief is enough to empower consciousness, on a grand scale, to make it appear that the seeds grow better when planted during the new moon. Could astrology work the same way? Once upon a time, someone saw a heavenly body transit the Sun and they got really excited about what they had found. Having some understanding of astronomical science, the person defined what the path for this object was in the sky and started telling others about it. The idea was met with interest by both astronomers and astrologers. While the astronomers tried to find Lilith in the sky, the astrologers where busy trying to figure out what it meant with respect to the human psyche. As the search for this moon continued, the astrologers picked up the calculations (the best they could) that represented where Lilith could be found in the zodiac and outlined (as best they could) what this moon would mean so as to get a richer understanding of the human psyche. The astrology community embraced the discovery and pretty soon everyone that cast a chart included Lilith. Unlike the planets, this is a moon so it never turns retrograde. Unlike the moon that we can see, this one is dark, mysterious, lightless. It’s as if it’s hidden or it represents that which people would hide deep within themselves. It is the secrets, the nasty dark thoughts, feelings and experiences that people suppress or want to hide. As more psychic astrologers intuitively reached out to discover what this Dark Moon Lilith represented, they encountered something that is also non-tangible or ethereal. As they did, they associated the moon with witches, dragons, elves and fairies. Others saw it as being an influence that prevents a person from growing, or that it shows the characteristics that must be overcome in order for a person to mature into a complete, whole, Being. Others went as far as to say that Lilith represented the demonic energies that seduced men in their sleep and harmed women during child birth. While the astronomers continued to comb the sky for this second moon, the astrologers found the myths and legends where Lilith fit and committed the archetype to memory. The astrologers did the best they could to define Lilith’s place with respect to the human psyche and the subconscious learned. Yet we fast forward to today. This second moon still doesn’t exist to the astronomers. They will argue up and down that it doesn’t exist. Just like they will argue that fairies don’t exist. Just like they will argue that the nightmare that you just experienced is not real. Just like little Johnny’s imaginary friend is NOT REAL! But what is real? I have a very good understanding of what a fairy is. I’ve seen pictures, I can picture it in my mind, I can feel how it would be to interact with a fairy. Sure, I might not be able to touch a fairy, but I am fully aware of what a fairy is. Likewise, when I have a nightmare and I wake up in a cold sweat, no one would deny that I just experienced something that affected me physically. When you look at a child that interacts with his imaginary friend, you can clearly see that the child is interacting in a very physical, emotional and mental way. Can you say with 100% certainty that the child is pretending? If astrology is a consciousness science, the existence of the influences brought to the world through the Dark Moon Lilith sheds light on the idea that there are aspects of the human experience that are non-tangible yet, they directly affect how we perceive our situations in life. The Dark Moon Lilith seems to have stepped forward to help humanity realize that there is a world where you can interact with dragons to the point where they can fill you with terror or make you overflow with joy. There is a state of mind where you can hold the hand of a fairy and fly unbounded through the sky and the resulting sensations can be exhilarating or debilitating based on how you perceive the adventure. Lilith teaches us that consciousness is not bounded by physical matter, but rather the physical experience is enhanced by what the mind can imagine. Now that you’ve read this interpretation of the Dark Moon Lilith, your eyes may now be open to see that the things that Lilith is involved in which can be felt as either good or bad. It’s all a matter of your point of view. When you search, look at how the Astral Plane has been described. Look at that plane of existence which is just barely removed from the physical that would be the place where ghosts and demons live. Think of it as that place you are in when you dream at night. Think of it as the adventure movie or book that you get emotionally consumed by. At the root of it is the imagination, but the effect transfers into the physical reality in which we live today. It could be thought of as the place people go to when on an Ayahuasca adventure. It is a place full of conscious beings that can interact with the human consciousness. That which is experienced there becomes memory just like any other ‘real’ experience. I am looking forward to the day when the most well-known astrology programs bring back the Jacobson calculations of Lilith for astrologers to use. The reason is that the astrology consciousness was built around this ephemeris rather then the Waltemath numbers. Yes, the scientist in you will say that the numbers are simply made up, but that is not a good enough reason to discard them. The astrology community has built conscious rules around what it represents and would like to follow it moving forward. In my research, I found one source that still calculated Jacobson’s Lilith locations and I used that to create an approximation for the placement of Lilith on my AstroMap. The accuracy seems to be within a few minutes of the source. I would actually love it if the swiss ephemeris added Jacobson’s Lilith information. Sun 04° Taurus 08' 21"
Moon 08° Capricorn 20' 25"
Mercury 09° Aries 54' 34"
Venus 04° Aries 46' 27"
Mars 16° Gemini 01' 14"
Uranus 02° Taurus 37' 23"